When we reflect on the past or look forward to the future, we tend to focus on specific moments or events. We may look back on championships won, performances given, or accomplishments earned, or we may look forward to weddings, vacations, and birthdays on the horizon. It is easy to fall into the trap of viewing these events as isolated moments of bliss and either longing to recreate that moment or planning to have the perfect moment in the future. If we strive only to perfect those singular, isolated moments and set that as our ultimate goal, then we will be nothing but stressed, disappointed, and disenchanted. Those major events and moments do not exist on their own. They are endings and beginnings that capture our whole lives, summarizing and foreshadowing all at the same time. It is within these moments that our lives are lived. It is within these moments that we find joy, experience sorrow, celebrate success, and reflect upon what is to come. I consider myself a rather romantic man, and so I wanted the moment I asked Katie to marry me to be a moment she would remember for the rest of our lives. My plans initially were all over the map. We work at the same school, so should I surprise her at a school assembly or after a school Mass? Should I rent out an entire restaurant so we could have the place to ourselves, only to have our family and friends emerge from the kitchen? Would it be a day-long adventure culminating in the moment when I drop to one knee? I wanted it all – I wanted it to be perfect. I wanted it to be the moment to end all moments. And then I remembered that this moment is not about me being “victorious” or “impressive” so that everything else for the rest of our lives paled in comparison. This was a moment about us, a moment that would capture who we are as a couple, summarize how we have grown together in our relationship, and prepare us for the life we would share together as husband and wife. St. Thomas Aquinas teaches us that knowledge is in service to love. I had grown to know my future wife quite well over the months of our dating, discovering that Katie is an introverted book lover who hates surprises but loves thoughtful, spontaneous gifts. So, I decided to make my proposal plans around her personality. Knowing her favorite books growing up were the Harry Potter series, I decided to incorporate her “first love” of reading and Harry into the adventure upon which I would send her. I knew these things about my bride-to-be, and I wanted to use this knowledge to create a moment that would set us forth on many moments of engagement and marriage to come. After convincing Katie that I was going out of town for a friend’s bachelor party weekend in Baltimore, I left school early one Friday to go set up a Harry Potter themed scavenger hunt around town that would remind Katie of the story of herself and our relationship. The first clue, written on handmade Hogwarts Stationary from Harry Potter himself, led Katie to her childhood home where she had first read these books she loved so much. There, I met her, acting like a simple “muggle boy” that picked her up with no knowledge of the bachelor party I was supposedly attending. Clue #2 sent us to the church in which Katie was baptized, where we prayed a divine mercy chaplet together in front of the Blessed Sacrament. The third clue brought us to a fine dining restaurant where we had a delicious gourmet dinner, followed by the fourth clue which brought us to the school where Katie was when I first sent her a Facebook message in May of 2014. Waiting for her was a copy of Hamlet, her favorite Shakespeare play, which I had quoted on the card the first time I sent her flowers. The final clue led Katie to the library in our school – a place she loved dearly and had spent a lot of time over her life. Where else would I propose to the book-loving, teacher/author love of my life? As Katie entered into the candlelit library, she was met with every gift and note she had ever sent me over the course of our relationship. Three roses were set around the final clue, a letter in which Harry Potter encouraged her to turn around to begin the next great adventure of her life. 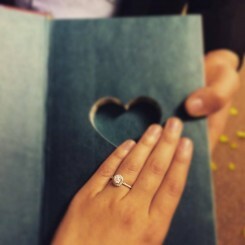 Behind her, I waited on one knee with a copy of Harry Potter and the Sorcerer’s Stone, the pages glued together and a heart cut out with a diamond ring resting inside. The moment was heavy with anticipation. I was, at once, both nervous and joyful. Everything was in that moment. It was the moment to capture all the moments of our relationship over 18 months of dating. It was the moment to foreshadow the life we would live together in the days, months, and years to come. As I knelt there in that library, every memory, emotion, joy, and sorrow we had ever experienced, both together and separately, was captured. It was the moment we had both been waiting for since we had first spoken on May 7, 2014. It was the incredible moment that began the journey of our engagement and soon-to-be marriage. It is the moment we will remember on June 4, 2016. That moment of our engagement, for which I planned and waited, was the moment to contain all our moments. 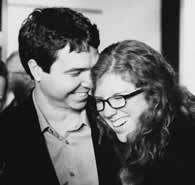 I can only imagine the gravity and joy of the moment when my bride emerges from the back of the church in a month to meet me at the altar. As we begin our married life together in just a few short weeks, we are setting out on a great adventure, filled with the unknown. No amount of couple mentor meetings or books read or conversations had or prayers prayed will reveal just what is waiting for us on the other side of husband and wife. But the moments to come, which we hope and pray are filled with great joy and love of each other and the Lord, are the moments for which we’ve been waiting. They are the moments we’ve prepared for as we’ve experienced and reflected upon our relationship. They are the moments to be built on the strong foundation of our prior moments. They are moments in which we’ve worked to ground ourselves in Christ and lean on one another so we can be firmly rooted in a charitable, virtue-filled, sanctifying love of each other and of the Lord. My prayer in this final month of our engagement is that I have learned the lesson that our wedding to come is just one day of moments that will set us out on a marriage filled with moments of joy in each other and growth in holiness together. My hope is that I have learned that our marriage does not exist on its own accord, but is the encapsulation – the very expression – of the lives of two people who have been formed and shaped over the years. I pray that in these final few moments of our engagement, I will be made ready to experience the love and joy of the moments to come. This is the moment, and I am eager to see where it leads us. Look forward to your life together as a married couple, not just the wedding day. A few thoughts on celebrating your bachelor party the right way.